I love this! Love the style and the mood. Very, very nice! Beautiful color and style! Wonderful patterns. And I love the hat! Beautiful illustration! Love the color and texture of your artwork! 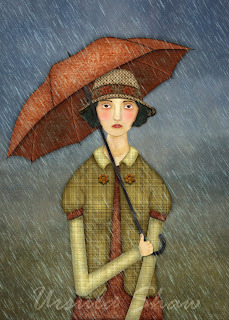 Lovely palette, I can definitely relate to how she feels in the autumn drizzle. I really appreciate the stylized technique that you use in your illustrations. This one is a favorite!